Wallet is above all a Belgian artist, specializing in landscapes, beach scenes and marines which are imbued with the austere beauty of the North Sea coast, and full of the vast skies of Flanders. He also produced portraits, drawings, engravings and still life paintings, at first in a realist style, but after the Second World War in a more impressionistic manner which owed a slight debt to Ensor. Later on he would pay increasing attention to the composition, stylization and development of his subjects. His works are notable for their poetry, joie de vivre, optimism and sense of well-being and tranquillity. 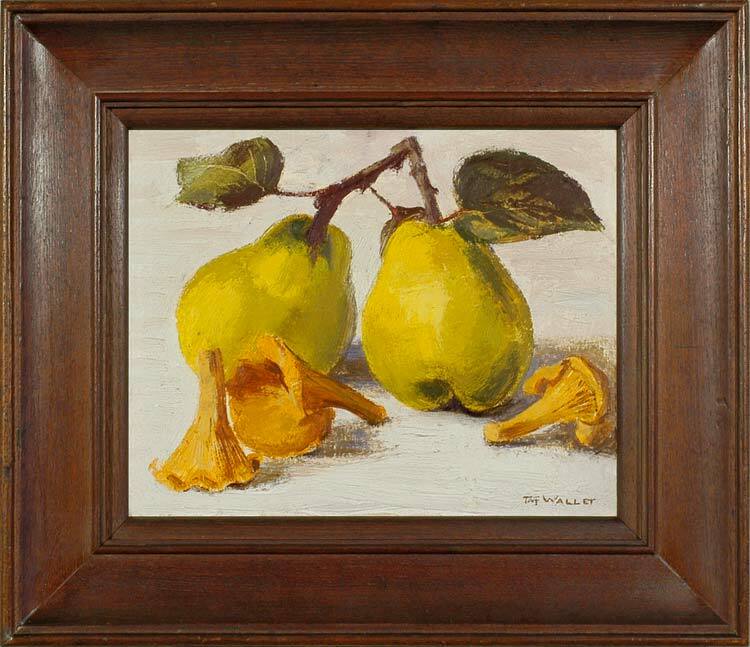 This still life painting of pears and chanterelle mushrooms vibrates with taches of pure, clear colour, of the kind which transfused Wallet’s work from the period of his travels in France and Italy. No black has been used – the shadows are equally created from pure colour; there is, however, a great sense of depth and recession for such a small painting, and each object has a solid plasticity. As an adolescent Wallet attended the Ecole Industrielle in Louvière, where he learnt the crafts of wood- and marble- working (1916-17). He graduated to the Académie de Mons (1920-22), and finally attended the Académie de Bruxelles, where he was taught by the symbolists Constant Montald, Jean Delville and Emile Fabry (1922-26), in 1925 winning first prize for composition and painting. Wallet was a painter, mosaic-maker and stained-glass designer. From 1923 he lived in Schaerbeek, but in 1933 he bought a property in Saint-Idesbald, where he was to settle down. In 1928 he was awarded the Prix Godecharle (for La fête de l’Aïeule, Musée de La Louvière) and third place in the Prix de Rome, and from 1928-30 he travelled in France and Italy on the scholarship he received. In 1934 he was awarded the Prix de Hainaut. He taught printmaking from 1947, and landscape painting from 1959, both in the Institut National Supérieur des Beaux-Arts in Antwerp. He won the Prix Chardin for engraving, and the Prix de l’Essor Maritime (1954). He was commissioned to produce a large-scale mosaic in the Louvière swimming-pool (1952-54), and stained-glass windows for the church of Saint-Cyr and Julitte à Seneffe (1968). He also painted a decorative fresco in art deco style in the Ecole de la Marine de la Métropole in Antwerp. He was a founder-member of the Nervia group in 1928 and the Société des Peintres-Belges de la Mer, committee member of the Alliance Française and of the Conseil National des Arts plastiques, member of the Cercles de Bon Vouloir, Les Amis de l’Art, and Les amis de Hainaut. Works in public collections include those in the Musées de Bruxelles, Ixelles, la Louvière, Antwerp, Ghent, Liège, Mons, Charleroi, Tournai, Naumur, Reims and Musée d’Orsay, as well as in museums in Tallin, Moscow and Buenos-Aires. The Museum Taf Wallet is located in Saint-Idesbald.